When Nat came into the studio to design an Engagement ring for his girlfriend he couldn’t have predicted how stunning the end result would be. Both Nat & Jodie had a very special day, after a tough few weeks for them this certainly was a bright sparkle for the family. They were kind enough to share their story with us. Thank you to you both! Thank you so much for designing my amazing ring! I can’t stop looking at the damn thing! 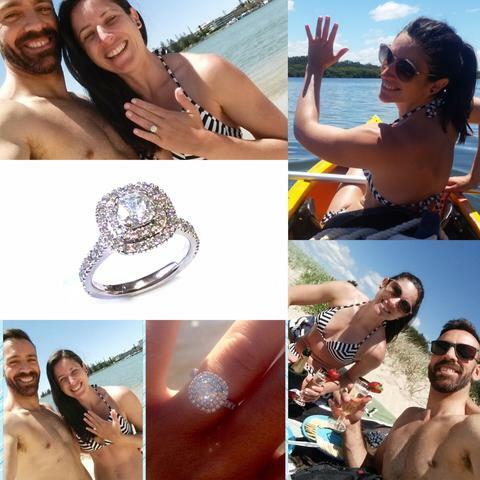 The standard reaction when I show people is “OMG” or “Look at that ROCK” or “That is the most amazing ring I have EVER seen” and the last comment was from a friend who was married and had her own ring!!! Sorry fellas, Nat has truly set the bar and ruined women all around the world. I had the most amazing day. He took me kayaking in an estuary in Port Macquarie, where I grew up. He had the ring in a back pack with the champagne for our picnic. I remember thinking he was being overly protective about the backpack (completely unaware of the precious cargo), and I was joking with him about how much he was protecting that fancy bottle of champagne! Thank god we did not capsize the kayak and lose the backpack, champagne and ring! We paddled around to a private island and set up our picnic. I was blissfully unaware he was going to propose and I was sipping champagne, lapping up the sun, and telling him all sorts of stories about home. While I was talking he took my sunglasses off me and cleaned them (I later learned he did this because he wanted to see my eyes when he proposed). When I finally drew breath, he said “so I was wondering….” and then pulled out the most amazing, blinding, sparkly, magnificent ring I have ever laid eyes on. Apparently he asked me to marry him, but all I could hear was white noise. I had my head in my knees, crying and laughing and I’d look at him, look at the ring, look away, scream, cry, laugh; and repeat. Nat kept saying “well, what do you say!! !” I eventually said YES, of course. Afterwards, we paddled the kayak back to the boat shed, well let’s be honest: Nat paddled the kayak back while I waved my ring around examining it under the light and reflection of the water. Enter ‘I’m a princess’ mode. When we got back to the boat shed to return the kayak, we told the owner Nat had proposed and I waved my shiny ring around. The owner immediately teared up and shook Nat’s hand and congratulated us. He said he’d had the kayak business for 36 years and we were the first proposal story, and he couldn’t wait to tell his wife. He said we made his day! Then we met up with my family to share the news. There was more champagne as well as fish and chips down at the local beach where I grew up. It was the most special day of my life. The ring truly is magnificent. I love how you have left it open underneath to let the light shine through the main diamond. It catches the light from all angles (especially the reflection from water: good choice of proposal location Nat). I love how you have made a tower with the three layers leading up to the main diamond. I love the rows of diamonds encasing the main diamond. I love the delicate band. I love how the whole setting is timeless, classic and sophisticated. It looks so amazing on my hand. If you can’t tell yet, I bloody love this ring. More importantly though, I love the man who gave it to me.